When me and my parents first came to America from Peru, I saw my parents struggle financially. I remember their frustration, but more evident was their determination, and their insistence on making my childhood great no matter how many obstacles they had to face. One of our first Christmases here, I remember that they only had about $15 to spend on my gift. Although they wanted to get me a big gift, the money was just not there. Instead, they went to the dollar store and bought as many one-dollar gifts as they could afford, wrapped them, and made my Christmas morning incredibly special since I had about 10 presents to open! After being naïve about immigration issues throughout my childhood, I found out that I was undocumented in middle school. My friends would joke about “la migra,” but I did not know what they were referring to. For the most part, though, I did not face the turmoil of being undocumented until my junior year of high school. I could not apply to certain programs and scholarships simply because of my status. Like my parents when they arrived in the United States, I was frustrated, but my frustration was countered with determination and I determined to prove to others that I am more than a legal status. Thanks to DACA and TheDream.US, I could afford attending Rutgers-Newark where I am studying accounting. I am beyond thankful for my experiences there and enjoy the diversity of the campus. 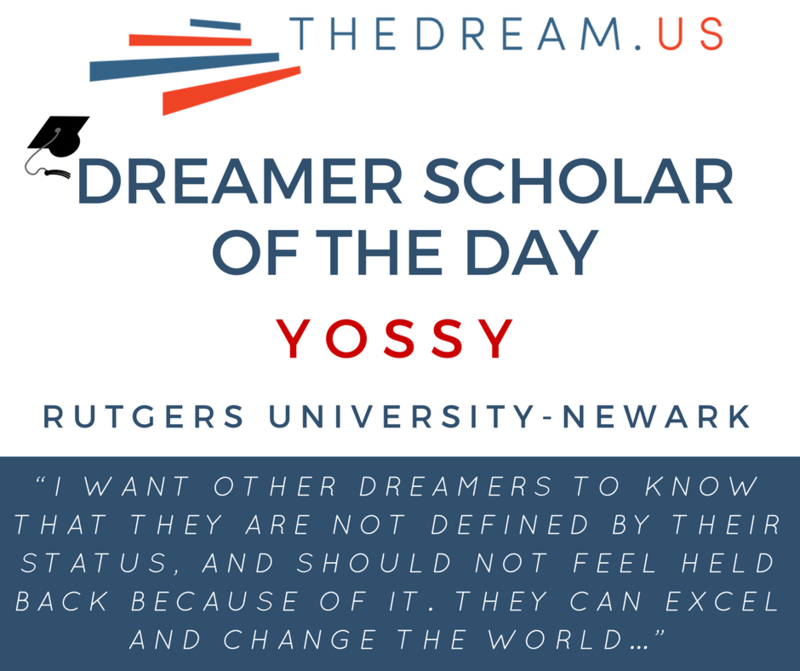 I am currently the vice-president of the Honors College Student Council, a fellow of America Needs You-NJ, and serve as treasurer of RUDreamers, a campus club for undocumented students and allies. This summer, I interned at one of the Big 4 accounting firms, PricewaterhouseCoopers, and was extended a return offer as a tax intern this coming summer! I have also started a small mentoring program for undocumented students in my hometown to help mobilize them on their journey to college.I want other DREAMers to know that they are not defined by their status, and should not feel held back because of it. They can excel and change the world if they set their minds to it. Also, never forget where you came from, instead, pay it forward to others just as people have helped you. Personally, I want to continue to mentor younger, first-generation college students on their journeys to success and encourage them to not give up. Professionally, I would love to work as a tax accountant or an auditor at a Big 4 firm after graduation. Without DACA and TheDream.US, these goals would have been mere fantasies but with them, my dreams have taken flight.